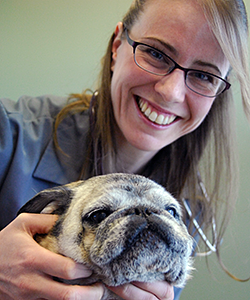 Dr. Erin Perotti-Orcutt is the owner and visionary of Four Paws Veterinary Center. She came to Seattle in 1994, after receiving her veterinary degree from the University of Tennessee. She opened Four Paws in order to create a hospital where she would truly enjoy working, serving her local community, and could bring her dog to work. 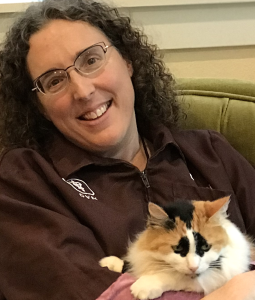 Erin has a special interest in integrative medicine, feline medicine, and end-of-life care. She and her wife Paige share their home with their two children and a rotating assortment of dogs and cats. Erin spends her “free” time homeschooling their children, leading a Girl Scout troop, and cooking. She is currently two years behind on her Netflix queue. 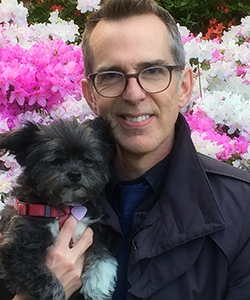 Dr. Brian Thomas-Jones joined Four Paws in 2004, after receiving his DVM from Washington State University. 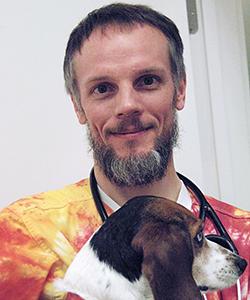 His love of science and his connection with animals were a natural fit for his path toward veterinary medicine. He brings a gift for the art of medicine, a practical approach to patient care, a foundation for nurturing the human-animal bond, and an excellence with surgical procedures and dentistry. Brian enjoys spending time with his family. He and his wife have two children and a pair of adorable kitties (Savannah and Ocean) at home. When Brian is not working, he loves cheering for the Seahawks and Sounders, gardening, hiking, camping, and mastering his tie-dye! Dr. Eric Hartmann graduated from the Virginia-Maryland Regional College of Veterinary Medicine in 1990. During time off from his human acupuncture practice, he practices veterinary medicine for the joy of it. His interests include internal medicine, geriatric palliative care, and the human-animal bond. We are delighted that he finds his outlet at Four Paws! Eric lives with his husband Jeremy and doted-upon Shih Tzu mix, Schmeegla (Foo-Foo to those close to her.) He enjoys traveling, beekeeping, and gardening.